Which floor you select really set the tone for the whole outdoor kitchen design. Avoid glazed or porous tiles and stone since they can be slippery when wet, especially if you have children or elder people in house. Better if you choose this materials: concrete, brick or natural stone. Ceramic tile is also a popular choice that offers a variety of colors and finishes choose from and slip resistance. Cost influenced by quality, type of material, affordability, durability and difficulty of installation! Because of its affordability and durability, concrete is still far and away the most popular outdoor flooring option. Stamping, coloring or a rock-salt finish are increasingly popular ways of improving the appearance of concrete to meet today's design trends. The most popular outdoor flooring option presently is concrete because of it's affordability and durability and suitable for you who have medium budget. Concrete can be expertly colored and stained to mimic real stone. You can mix bar-tile trim stamps with cobblestone or Ashlar Cut patterns." Cal-Ga-Crete of Rancho Dominguez, wet casts into molds that resemble hundreds of varieties of tile pavers. Cal-Ga-Crete's surface styles include variations of traditional mission and chateau pavers and replications of some surprisingly authentic looking antique pavers. Its color pallet includes saturated, rich colors that can be quite effective in creating Spanish, Mexican, Italian or French rustic styles, or a Pacific or Caribbean island effect. To add a trendy look you could choose stamping, coloring or a rock-salt finish. For higher budgets try considering authentic flagstone which are available in a variety of colors and textures. When you've already used stone or brick in other outdoor rooms or landscaping, it's also important to choose an outdoor kitchen floor that either matches or complements the style of those features. Contemporary. Try slate or cast-concrete tiles designed to be outdoors, such as Cal-Ga-Crete or clean, washed concrete in integral colors. Slate is an extremely durable natural stone product, and comes in many colors, textures, shapes and sizes and is also stain-resistant. Tuscan style. Tuscan style are inspired by the elements of nature. The look of Tuscan style decorating is rustic, warm, and inviting. Nothing should look shiny and new. Tumbled Pavers, unhoned travertine, deep-washed exposed aggregate or stone-texture stamped concrete. English/Traditional. English/Traditional style make use of Brick or darker flagstones, washed concrete or stamped cobblestone concrete. Tropical. Flagstone or faux rock texture-stamped concrete. Old World. Repurposed brick, exposed aggregate, Windsor Cobblestone texture stamps, fleur-de-lis and grape vine borders. There's also a knack to placing the flooring. Using stamps such as vintage grape vine detail or fleur-de-lis patterns to create a frame around the outdoor kitchen space. Take a couple of practical steps to make sure your outdoor floor lasts for a long time. Be careful to select a stamp pattern that's not too deep to drain or to allow you to set outdoor furniture level on top of it. Apply a good-quality penetrating sealer around any floor that's in the cooking or dining areas to protect your flooring from oil and wine spills. Each person has a different taste for the kitchen doors and the choice will represent owner personal style. Durability and low maintenance should be the main consideration to choose the cabinet material is. As most of the cabinet carcasses nowadays are made of chipboard, the only thing you have to worry about is the finish of the kitchen doors. First of all it is important to choose which material you want to use for the kitchen doors. Now that you have considered both the type and shape of your cabinet door, its time for you to consider how you plan to decorate the door. Wood veneer is a thin slice of solid wood applied to plywood or particleboard with glue to give it strength. It’s cheaper than solid wood. Its uniform in finish and its grain very consistent. Wood veneer provides constancy by minimizing its shrinking and expansion in climate changes which ultimately eliminates cracking and splitting. 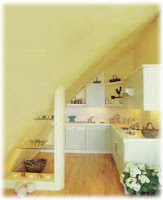 Wood veneer can be glossed, painted, color washed or waxed. 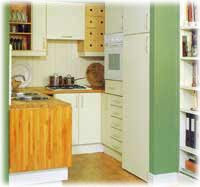 A great way to enhance color to natural wood cabinets. So many colors available to choose. It can be made to look smooth, glossy, or utensils can be used to give it a special texture. Paint will eventually reveal hairline cracks at the joints of solid wood doors. These cracks are formed when the wood expands and contracts. Plastic Laminate available in all kinds of colors, patterns, shine and textures. Maintenance free, very resilient, stain-resistant, and easy to clean just wipe it. Plastic laminates can be decorated with a stainless steel, brass, or wood trim or solid-color laminate. Laminate kitchen doors suffer from a lot less wear and tear and will stay fresh for a good number of years. It is definitely more expensive than paint and requires much more time and effort to achieve your desired results. It can be either glossy or matte finish. Polyester fills the pores of the door giving it a solid look and feel. Stainless steel give a sleek, clean and professional look effect to the kitchen and available only in several color. Resistant to corrosion and staining, low maintenance and very durable. Watch out for fingerprints and scratches. The metal covers an inner core material which prevents it from sounding to clangy. Cabinets with glass can be ribbed or etched with a vertical, horizontal, or diagonal angle. Some prefer that the glass be ribbed or etched so that it hides what is behind the cabinet door. You also have the option of making the glass clear or colored. Use glass kitchen doors for protected display of your crockery, or use frosted glass for a concealed, but still open look. Glass will look beautiful in both traditional and contemporary rooms, whereas frosted glass works best in a contemporary kitchen. Kitchen cabinets are a great investment in the house. You'll want to make sure you are choosing the right cabinets contractor for your new house and your budget. Kitchens have become the functional and social hubs for many families. Of course everyone one the best for kitchen, include the design, the appliances, storage, utensils and all stuff that were needed. But, there’s always a design flaw in each kitchen, and this flaw can be changed to make the space more workable. There’s always a problem for many people when want to start make a changing for their kitchen; tight budget, building restrictions, tiny condominium where you must work with the space allotted, it’s horrible. Do I have options to transform my kitchen? Yes, of course. Let’s check this out. Energy efficiency is a key factor to keep in mind when purchasing home appliances. It is usually more cost-effective to purchase household appliances with high efficiencies. For homeowners who entertain regularly the kitchen wine refrigerator has become very popular. There are even counter-top fridges to keep just a few bottles at a time properly chilled. Install a tile back splash on all the walls above the counters, stove and sink. This can quickly change the look of the kitchen and make it easier to clean. You can squeeze as many cabinets into your design as possible but always consider the placement. Install a deep cabinet for hold plate and placed it near the dishwasher. While large cabinet with slide out drawers should be placed near the oven. Built in a storage for food and other materials, and other storage for bread storage. This design will give the kitchen a cleaner look. Change the cabinet and drawer knobs. This is a very simple and affordable option that will give the kitchen an extra special touch. Put a wire basket on the inside of the cabinet under the sink on the back of the cabinet door to hold trash bags and other frequently used items. Counter space is needed so that can make you easier to work coz there is free space. Don’t cover this area with appliances too much. If the difference in floor space is a matter of a few square feet, plan your design with deeper counters. This Counter can be made from granite, marble and stainless steel but it’s expensive. For lower price you can make it from laminate. Different materials can make different environment. For example, marble and granite offer cool surfaces for handling dough while the butcher block allows one to easily chop and prepare food. You can also combine those materials to create a unique look and a more functional kitchen. If you are in an apartment or a small house, a large sink in the kitchen can serve double duty as a utility sink. Large sink can make your job easier to clean large pots and pans, and is a great place to stash the dirty pots before you have a chance to rinse. Install water heater on the sink. Installing such a device will usually replace the sprayer or soap. This really useful if you indulge in a cup of tea or instant coffee each day. If there isn't enough room for a closet pantry, install roll-out pantries. These can be pulled out to view the items you have, but rolled back into a space about 18 inches wide and 5-1/2 feet tall. If there isn't room for any type of pantry, consider converting a closet outside of the kitchen to a storage area for fine china, large pots and infrequently used items. Under-counter lighting and clean halogen lights can make the space appear larger and more comfortable. What can you do if you want to remodeling you kitchen but your budget can't fulfill you're your wish? Here, the simple, easy and cheap steps you can do by yourself to make your kitchen more comfortable. If there's curtain in your kitchen, go change it with different color and motive to give a brand new nuance. 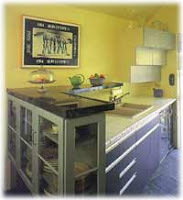 You can pick a bright and clear color, squared motive or vegetable and fruity motive to give a fresh nuance in kitchen. You can combine few colors in one room without give a crowded and tacky impression. For example, paint yellow as a basic color then paint teracota color on the border. You still can combine with other color such as dark yellow or dark peach. Just like the curtain, alteration of the wall painting color can change the nuance significantly. Let's do some experiment on the kitchen cabinet! Such as repaint with stretch line motive. You also can add some pictures, such as flower or seasoning which you like. If the cabinets start to peel or look dirty, repaint it. Your cabinets will look new. Try to put a hand made kid creation. You can not just put this decoration on the refrigerator but also can be put on the wall with a pretty frame. You can freshen up your cabinets and don't have to buy the new one by refinishing the cabinets. It's fast and inexpensive way to have a brand new look kitchen! So, let's check these several methods and you can find out how to start it. Paint is a great way to hide imperfections on otherwise perfect cabinetry. So long as the innerworkings are functioning well, a fresh look is just a few steps away. While it's important to speak to your manufacturer or local hardware shop about which specific steps are needed for your cabinets, the following overview should give you a solid idea of the project's scope. First, clean the cabinet's surface. Fill in any scratches or indentations with wood filler. Sand with 180- to 220-grit sandpaper. Apply a coat of shellac based sealer to help the paint adhere. If you want your kitchen look more attractive and unique, you can use, decorative painting or use a two tone color scheme (painting your moulding a different shade than the cabinet itself). Effect and result of the painting using this method could be various, depend on the way you apply the paint. Contrasting colors pack a punch, while similar shades blend more seamlessly. An easy finish to keep up with, future cabinet dents or scratched can be quickly covered. Use a natural sea sponge for the best result. Avoid sponge from kitchen sink! This painting produces floating color and if you apply it heavier, it will looks cloud like similar to parchment paper. This method produces a rag-like effect, as if moderately-sized patches of paint were applied with a rag. You can highlight the wood's natural grain by pickling The cabinets wood. It is best done on open-pored woods like oak and ash, because the majority of the pigment remains in the pores, making the grain more apparent. Semi-transparent white or off-white pickling stains can be purchased. With roots that reach back to Egyptian times, stenciling is a tried and true way to add visual interest to uninspired cabinets. this technique mimics a textured sandy effect. Consider this decorative method for your moulding and trim. Clean the wood before apply the stain. Apply an even coat to a manageable area. Don't fuss too much over a perfect application apparent brush strokes won't be a problem. Allow the stain to sit for approximately 10 minutes to permeate the wood. Remove the stain in long soft strokes using Using a folded wiping cloth until desired look achieved. You can repeat the process if you think it's not enough dark. the final step : to protect the pickling, coat it with two coats of satin or flat water-based topcoat finish.